Following up on its huge success of the last 5 years, the Montclair Bikery’s 5th Annual Turkey Ride to collect turkeys for the Human Needs Food Pantry took place on Sunday, Nov. 19, 2017. Cyclists met at the Montclair Bikery at 145 Valley Road at 9:00 a.m. and rode 15-mile circuitous route to the Brookdale Shoprite on Broad Street, Bloomfield to buy turkeys. This year, 255 frozen turkeys were delivered by bike to the Human Needs Food Pantry, along with $14,523 in donations, which was then matched by Partners for Health Foundation, resulting in a $29,046 donation to the pantry! Left to Right: Mike Bruno, Executive Director of Human Needs Food Pantry; Pam Scott, Executive Director of Partners for Health Foundation; Linda Sterling, Ride Organizer and former Food Pantry Board President; Dave Adornato, Owner of Montclair Bikery; Tami Furman, Montclair Bikery Manager. 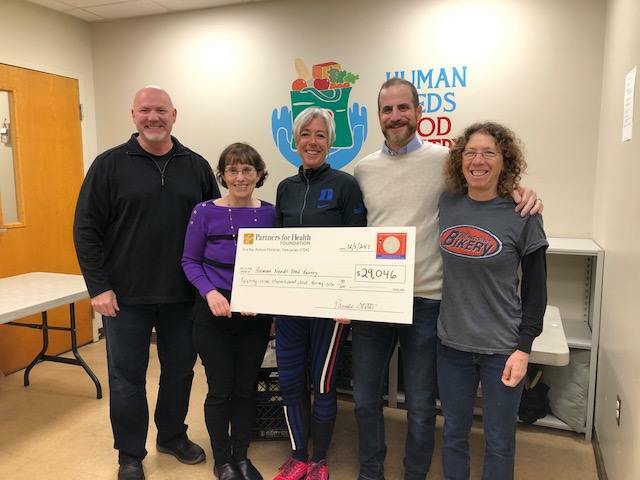 “Funds raised during the Annual Turkey Ride help to address the persistent issue of hunger in our community, while giving participants an incentive to be physically active. We’re proud that our matching grants program has contributed to the success of this wonderful effort,” said Pam Scott, Executive Director of the Foundation. Thank you to everyone who participated in this year’s Turkey Ride!